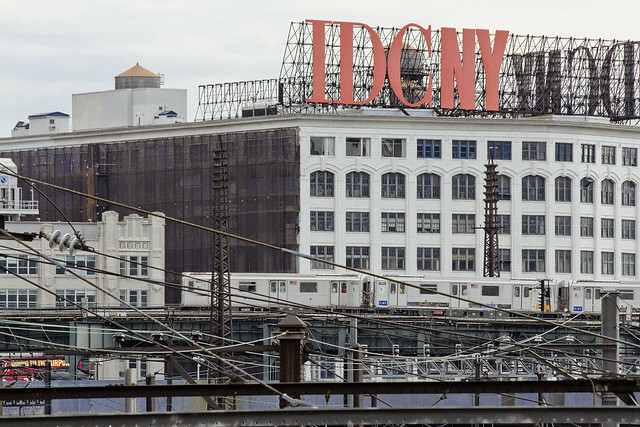 Famously, your humble narrator has a somewhat encyclopedic knowledge of the location of every single hole in the fencing surrounding the Sunnyside Yards which is large enough to stick a camera lens through. The Amtrak people patch these lapses all the time, but others will just spontaneously appear. It’s kind of a cat and mouse situation, but given that the Yards sit between HQ and My Beloved Creek, one spends a lot of time walking back and forth past the titan facility and I do so enjoy taking pictures of rolling stock. One particular chunk of our national railroad infrastructure caught my eye the other day – specifically Amtrak engine 631, which seemed to be possessed or something. It’s actually a bit of newish kit for them, btw. God help me for the fact that I know this. The Siemens ACS-64, or Amtrak Cities Sprinter, is an electric locomotive designed by Siemens Mobility for use in the northeastern United States. 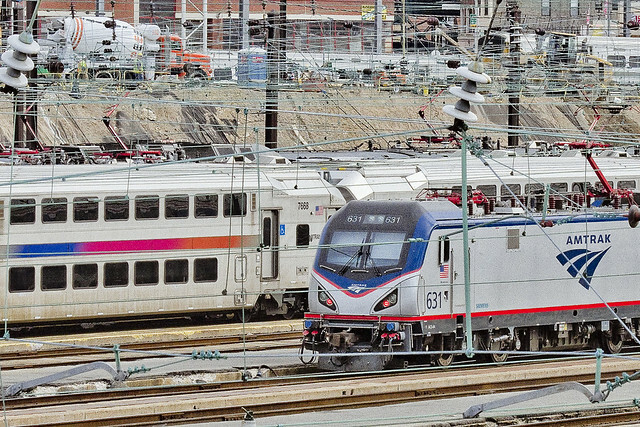 The first 70 locomotives built are to operate on the Northeast Corridor (NEC) and the Keystone Corridor, replacing the railroad’s existing fleet of AEM-7 and HHP-8locomotives. The first Amtrak ACS-64 entered service in February 2014; deliveries will last until 2015. 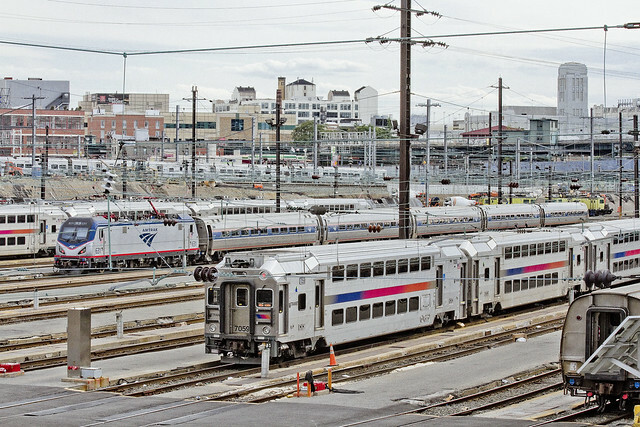 SEPTA Regional Rail will receive an additional 13 locomotives for commuter service in 2018. Notice how its “eyes” seem to glow red with fiendish intent? How the engineering of the thing’s leading edge seems to suggest angry eyes? Imagine having this thing bearing down on you while it was thundering down some lonely trackway in the woods of upstate NY. Something wicked this way comes, indeed. It would be chilling, I would imagine, having those red demon eyes fix their gaze upon you as it races through the North East Corridor at 125 mph. The Northeast Corridor (NEC) is an electrified railway line in the Northeast megalopolis of the United States. Owned primarily by Amtrak, it runs from Boston through New York City, Philadelphia, and Baltimore to Washington, D.C. The corridor is used by many Amtrak trains, including the high-speed Acela Express, intercity trains, and several long-distance trains. Most of the corridor also has frequent commuter rail service, operated by the MBTA, Shore Line East, Metro-North Railroad, New Jersey Transit, SEPTA, and MARC. Several companies run freight trains over sections of the NEC. Amtrak’s Acela Express engine 2000, in comparison, seems like it would be quite a friendly locomotive, although it’s general outline is somewhat reminiscent of the Toho studios “Kaiju” monster and frequent Godzilla sparring partner that is called Mothra (while still in its larval phase, of course). The Acela is certified with a top speed of 165 mph (266 km/h) and reaches a maximum of 150 mph (241 km/h) in regular service. The Acela Express is the only service in North America that exceeds the U.S. Department of Transportation’s 125 mph (201 km/h) definition of high speed rail. 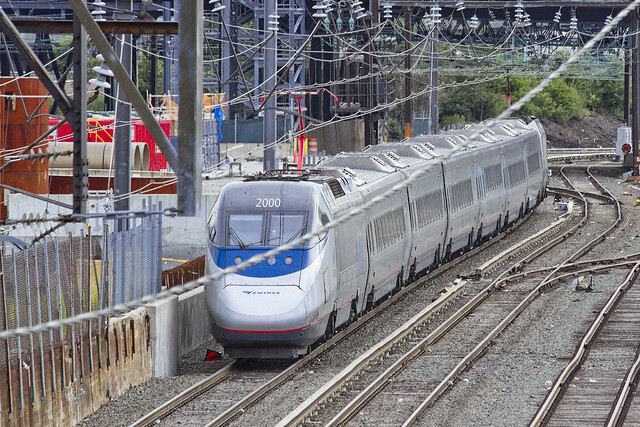 The Acela achieves an average speed (including stops) of 81.7 mph (131 km/h) between Washington and New York, and an average speed of 66.9 mph (108 km/h) from Washington to Boston. The average speed from New York to Boston is a slightly faster 69.8 mph (112 km/h). The average speed for the entire length excluding stops is 84 mph (135 km/h). Its maximum speed limit is 150 mph (241 km/h) on three sections of track totaling 33.9 mi (55 km) in Rhode Island and Massachusetts. Lamentably, there is a lack of folkloric tale telling about the various light and heavy rail lines that transit through Western Queens. Other parts of the country tell richly ornamented tales about ghost trains and haunted rail cars. Along the Metro North tracks that feed into Manhattan via the Spuyten Duyvel bridge, there are stories of a ghostly steam locomotive, for instance. You seldom hear tell of a haunted Subway or station, although some describe the appearance of the 7 along the elevated tracks in Sunnyside with hushed voices and describe it with an air of dread expectation. On June 13, 1915, the first test train on the IRT Flushing Line ran between Grand Central and Vernon Boulevard – Jackson Avenue, followed by the start of revenue service on June 22. Over the next thirteen years, the line was extended piece by piece to its current form between Times Square and Flushing – Main Street, after the former opened on March 14, 1927. Express service started in 1917. The service on the Flushing Line east of Queensboro Plaza was shared by the Interborough Rapid Transit Company and the Brooklyn–Manhattan Transit Corporation from 1912 to 1949; BMT trains were designated 9, while IRT services were designated 7 on maps only. The 7 designation was assigned to trains since the introduction of the front rollsigns on the R12 in 1948.